Unfortunately, it has been a time of illness and low energy round here just lately. Fortunately, spinning provides solace and the level of exercise I’ve been capable of undertaking. 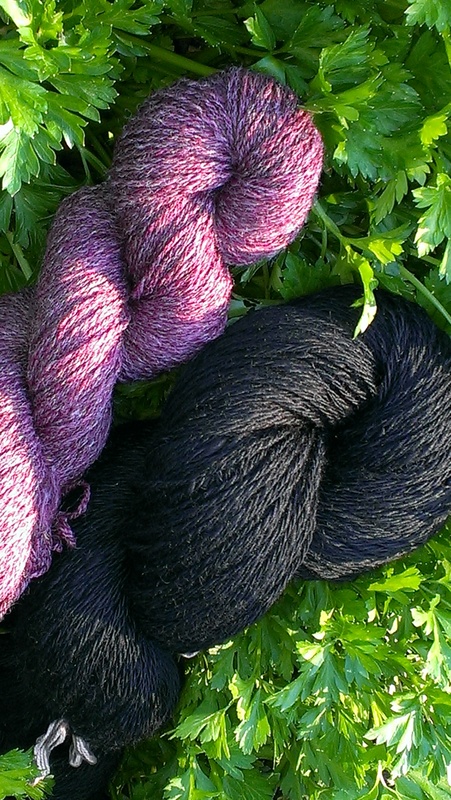 Here, some delicious black baby alpaca I bought from SpunOut at Bendigo (three plied). It is called Handspinners Dream and, mmmm. It was! Luxury fibre with a price tag to match. I also finished some spinning intended as sock yarn–the purple yarn in the photo. It is a true three ply yarn with high twist. I spun it slowly since it has been on the wheel I take to the Guild only twice a month. There have been many jokes about frog hair, and more than one person has asked me if I am really spinning, because the singles were so fine they couldn’t be seen from across the hall. I will be so interested to see how this works out as socks. Despite all the joking, this is not too fine for sock knitting. Since I have three pairs of socks on my needles at present and all three are still in the first sock stage, I may not find out for a while. I have one still on the leg, one just past the heel and still on the gusset, and one almost at the toe. Back to spinning though–and that is where my time has been spent lately–the purple sock yarn is from Ewe Give Me the Knits. It’s her Superwash Merino/Bamboo/Nylon blend, especially for sock spinners. Another lovely spinning experience. I am warming up to spinning some of the fleece I’ve washed through summer after all this pre-prepared fibre. Hope all are hale and hearty very soon! Thanks! The illness phase is over and we’re into reclaiming energy. We did a 5k run yesterday. Slowly, in my case. But the fact it was possible at all has me feeling like we’re headed in the right direction.